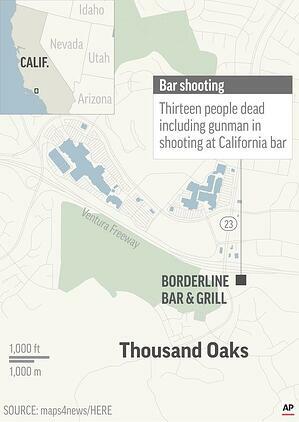 At approximately 11:20pm local time Wednesday night, 28-year-old Ian David Long opened fire inside the Borderline Bar and Grill in Thousand Oaks, CA, killing 12 people and injuring at least 21 others before reportedly killing himself. According to reports, when Long first arrived at the bar, he shot and killed the security guard before entering the building. Once inside the bar, he threw “smoke grenades all over the place” and indiscriminately shot at patrons. Law enforcement officers arrived on the scene within minutes and immediately made entry into the facility upon hearing gunshots. Long then shot and killed Ventura County Sheriff's Sergeant (Sgt.) Ron Helus, a 29-year-veteran of the police force. Responding officers pulled Sgt. Helus back to safety and transported him to the hospital where he was later declared dead. It is believed that Long committed suicide during this time. Authorities stated that Long was armed with a .45 Caliber Glock Model 21 semi-automatic firearm equipped with an extended magazine capable of holding 30 rounds. Long had a permit for the firearm and acquired the weapon legally. Although the number of shots fired during the attack is still unconfirmed, it is believed that Long reloaded his weapon at least once during the attack. A clear motive behind the attack is currently under investigation, but law enforcement officials stated that Long had "minor" run-ins with police in the past and may have had mental health issues. In addition, authorities said that Long was a U.S. Marine Corps veteran and speculated that he may have suffered from Post-Traumatic Stress Disorder (PTSD). The shooting demonstrates the type of tactics, training and procedures that can be conducted by proficient, experienced shooters. There are reports that Long had previously been to the Borderline Bar, which would make it a more familiar and well-assessed target. Long used both smoke grenades and a firearm to execute his attack, indicating his intent to ensure he was successful with causing chaos and exploiting his target space. Additionally, it was evident that Long’s military combat training and experience assisted in his skill to handle and reload his firearm quickly. The incident also highlights the risks posed to soft targets, which remain attractive locations for attack for potential shooters and other nefarious actors. The incident comes less than two week after another mass shooting at a synagogue in Pittsburgh, PA that left 11 dead and six others injured. The frequency of active shooter incidents has increased in recent years, and these incidents have affected numerous places where citizens congregate; such as schools, workplaces, places of worship, shopping malls, restaurants, bars and movie theaters. The recent mass shooting in California is also reminiscent of the 2016 Florida night club shooting that left 50 dead and 53 injured. These types of events highlight the need to reduce the risk of active shooter incidents while improving preparedness and strengthening ongoing efforts intended to prevent future occurrences. Regardless of motive, shootings are an increasingly viable method of attack due to their simplicity and impact in a condensed amount of time. The enhanced threat posed by active shooters and the swiftness in which these types of incidents unfold supports the importance of preparedness by first responders and citizens alike. The increased frequency of gun related violence is part of a nationwide trend that has sparked further development and coordination of security procedures. Given the continued rise in active shooter incidents in recent years, there is likely to be a further review of security policies and potential gaps and vulnerabilities.